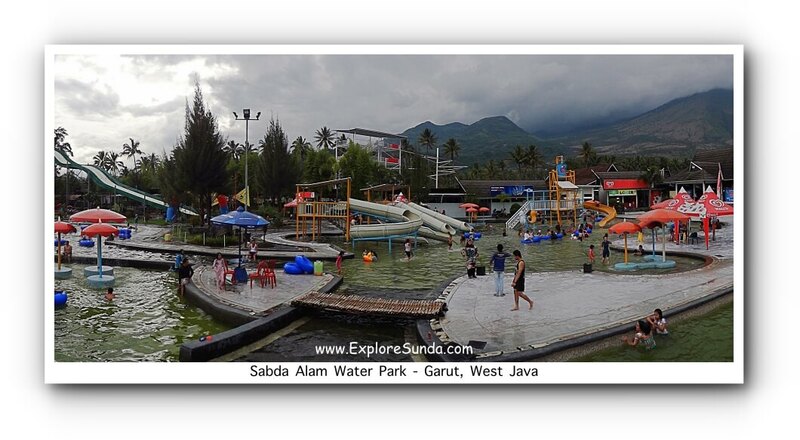 The town of Garut is located approximately 60 km south east Bandung. The weather is cool, since it is on a highland, 700 meters above sea level, surrounded by mount Papandayan (2622m), mount Cikuray (2821m), mount Guntur (2249m), and mount Karacak (1838m). They are active volcanoes that provide hot springs. As long as I remember, hot springs has always been the number one tourist attraction in Garut. It is located in the suburb called Cipanas, a very suitable name since it means hot springs in Sundanese laguange (ci=water or river, panas=hot). Over the years it has developed, from several rental bathrooms to swimming pool to simple hotels and now we can find several resorts equipped with waterparks. The best feature of these waterparks: the water is warm, a mixed between fresh water and the hot springs. Not all cities in Indonesia have a zoo, so it's surprising to know this town has one. The most popular animal in Garut is the ram. The latin name is ovis aries, but in general people know it as Domba Garut (Domba = sheep in Bahasa Indonesia). This sheep is a high quality sheep, as a result of crossbreeds between three kinds of sheep: local from Java, Capstaad from South Africa, and Merino from Australia. The ram has unique horns, they curl up on its strong head. Most of sheep farms in Sunda breed this variety of sheep because it has high quality of low fat meat. But the ram get a special treatment because good strong rams can join the ram fighting competition. Becoming a winner in this competition resulted in high price, because it can become a great stud. The ram fighting competition is a very popular tourist attraction originated here that has spread across the land of Sunda. Personally, I am afraid to see when the ram bang their heads to each other. 1. 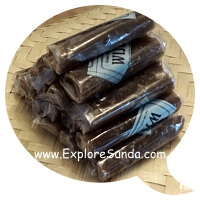 The most famous snacks are dodol and dorokdok. The other unique snack is called dorokdok. It is chips made from cow skin. We can eat it just like that. But we often eat it together with meatball soup. Another special souvenir we can buy here is handcrafted leather products made of sheep or cow hide such as jacket, wallet, shoes, etc. As you may know, each area in Indonesia has its own version of batik. In this town its special and unique batik designs is called Batik Garutan. Although there are only few producers, they preserve and enrich Sundanese batik. Several years ago, we can only find few restaurants in the center of the town. But nowadays it is easy to find so many restaurants, even before we reach the town. 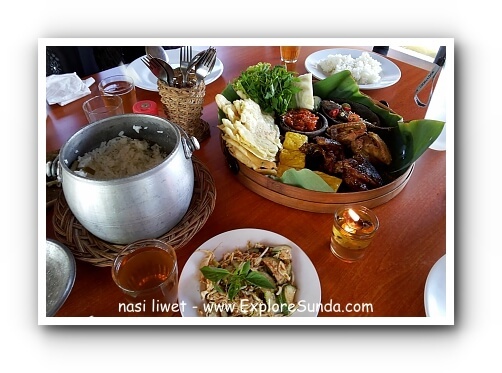 Most of them are Sundanese restaurants. 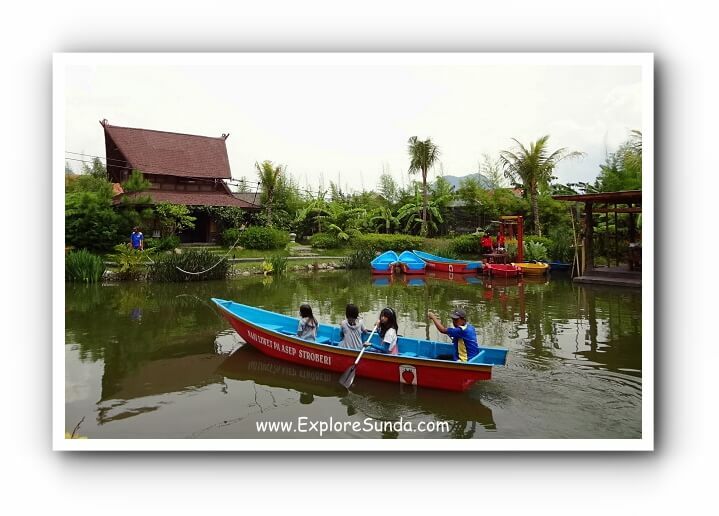 During our trip we passed several restaurants equipped with many outdoor games to entertain the children, such as flying fox, ATV ride, row a boat circling the fish pond behind the restaurant, bicycle, etc. However, we must buy separate ticket for each game. The traditional drink from Garut is called Goyobod. There are several modifications on how to make this ice, but basically the syrup is made of coconut milk and palm sugar, mixed with ice cubes, slices of coconut meat, avocado and hunkue (starch dough). It is the starch dough that differentiates Goyobod Ice from other types of traditional cold drink. You may find the best Goyobod Ice seller in a cart in front of the town mosque. However, please be cautious if you are not used to eating in pedestrian. Over the years, accommodations in Garut has upgraded substantially. It used to be small inns in down town and several are scattered around the hot springs in Cipanas. But now we can stay in the resorts! Popular hotel and resorts in this area are Sabda Alam, Danau Dariza and Kampung Sampireun. Danau Dariza is similar with Sabda Alam hotel. They both have water parks. Their locations are adjacent in Cipanas. What makes Danau Dariza unique is the traditional architecture of the hotel. The location of Kampung Sampireun resort is in the area called Samarang. It is the first resort in this area. The hotel rooms were built on top of a small lake. Thus, we can row a small boat to cross the lake. Nowadays it is very easy to go to this town, thanks to Cileunyi toll road and the new Nagreg ringroad. This town is only 60 km south east Bandung. Thus, from Bandung you should drive through Cileunyi toll road until you reach Cileunyi toll booth. This is the end of the toll road. Actually, we must take right turn at the crossroad. Since the crossroad is closed we must pass it, take a u-turn, so we return to the crossroad where now we turn left. You only need to follow the road until you see the sign to turn right at approximately Km. 35. We will pass Cipanas and Samarang before we reach the town of Garut.